A: This is my fifth year instructing in Vail. A: My skiing career began at an early age. I come from a big ski family and grew up skiing at Ski Valley in New York State (which is about 1200 vertical feet!). When I was about fourteen I established a berth on the US Development Team, and by age sixteen I was traveling the world with the US Ski Team competing in the ladies downhill. In 1979, 1980, and 1981 I competed in the World Cup for ladies downhill and was also a forerunner at the Lake Placid Olympics (because I was too young to race). I went on to college at UC Boulder, and soon after that transitioned into coaching. That’s what brought me up into the mountains. Once my two boys were of skiing age, I began working with young elite athletes and coached ski racing for the Summit County Race Team (now known as Team Summit) and later Team Breck for sixteen years. I also ran an early childhood learning center for a number of years. I then made the switch to Vail as an instructor. A: In the summers, besides raising my boys, I’ve taught art classes for the town of Breckenridge, run my own jewelry business, and taught sailing in San Diego. A: I speak Spanish on occasion. 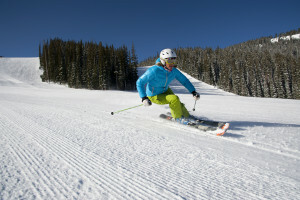 A: I’ve always had a passion for skiing at Vail and I really feel that it’s a phenomenal mountain to ski and teach at. It’s one of those places where once I grasp the depth of all the different terrain it just makes sense for me to be teaching here. I am so impressed with the resources that we as instructors have at our fingertips. We have so many opportunities to better not only ourselves but also each other by giving feedback or participating in clinics. You can gain superb knowledge from other passionate people. And of course my kids go to school here. A: There are so many different experiences to pull from; it’s a culmination of moments really. It’s about bringing passion to skiing and then really getting people excited to be here and to continue to be here. There are people that come here with so much gratitude that they’ll say, “Isn’t this the most beautiful day?” Every day we get reminded of what we are doing. When guests come to Vail, I am the first person they meet when they arrive. That’s what I’ve discovered about working here and in this industry. It’s the place to be, people want to come here, be here, live here. I feel really fortunate to be a part of that. I want to be the frame of their experience here. A: I secretly love the cold days, so that’s not a hard part. I guess it would be holding up to my own inner expectations as an instructor, whether it’s keeping large groups together, or wondering if their experiences were what they thought they were going to be: it has to do with my own self. A: I’ve had clients from the span of the world: Australia, Spain, Japan, and Russia. I had a really interesting client from Guatemala City once. It was only for a day but because I have been to Guatemala City I better understood where he had come from, and here he is in Vail, experiencing skiing for only the second or third time in his life! A: If I had to pick just one, it would be the day that both my sons were able to get on the chair lift with me, on either side. They were probably about two and four years old. This is the journey that I always envisioned: passing on skiing to my kids. A: One of the things that I love to say to people is I tell them to trust what they know and have experiences with. Embrace and enjoy the moment, never stop learning, no matter what age. Trust what you know that brought you here and put aside the things that involve you in your daily life. If you can open up and explore outside your realm a bit you allow for more learning, you become self-aware, and once you’re self-aware you can do anything. A: Powder! There’s nothing like a powder day at Vail. Dark, and stormy, and dumping. Then nobody is on the mountain and you get to ski so much more! A: I love Skipper on a powder day because it’s quiet. I also love Red Square, top to bottom. A: I really admire the way Vail preserves the depth of ski history it has here. It’s really apparent: a lot of people come here because they are part of that history. The old pictures everywhere are reminiscent of the era that I grew up in. My dad brought skiing to our family. It was a huge part of our lives and it’s such a great reminder about how simplistic skiing still is and can be. What a joy it is to give your kids the gift of skiing: it’s something you can do for the rest of your life, and it’s the gift that keeps on giving. Skiing speaks to everyone differently. Q: What is your favorite ski lesson to teach? A: I loved teaching Ultimate 4 and Max 3 this spring because these small groups are the best model for active learning. It gives guests the opportunity to learn from others in a smaller environment. I also love teaching beginners because they go from never skiing before to suddenly SKIING?!? What!? I don’t even remember that day because I was so young.